Eggs, potatoes, sausage, toast, and coffee at the cafe. 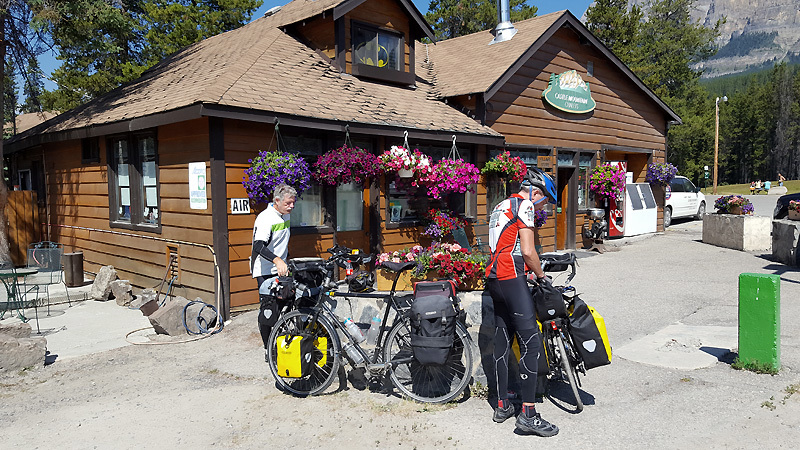 Alpine Centre hostel is a very fine place to stay when you’re in town.
. ride down to Johnson Canyon Campground (partially to Banff) to see about securing a tent site, then reconvene. An early stop at the nearby Wilson Sporting goods, where I scored 6 aluminum tent stakes. Yes! Then onward. 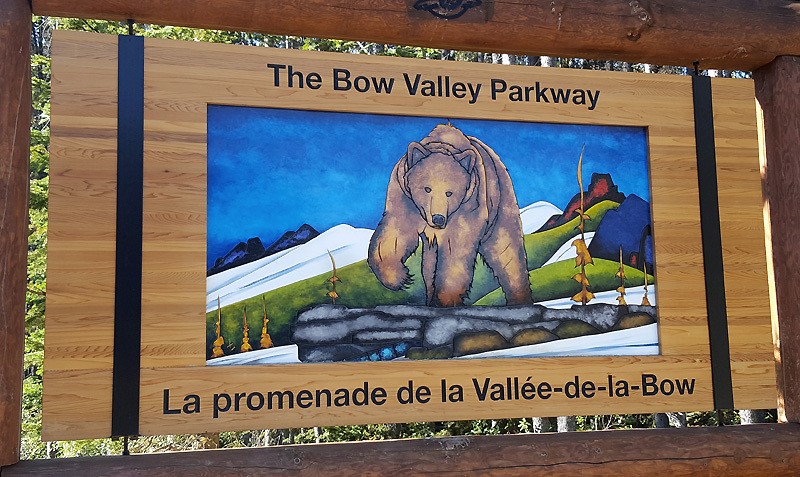 Bow Valley Parkway – route 1A – out of Lake Louise is killer. Secluded with very low traffic. 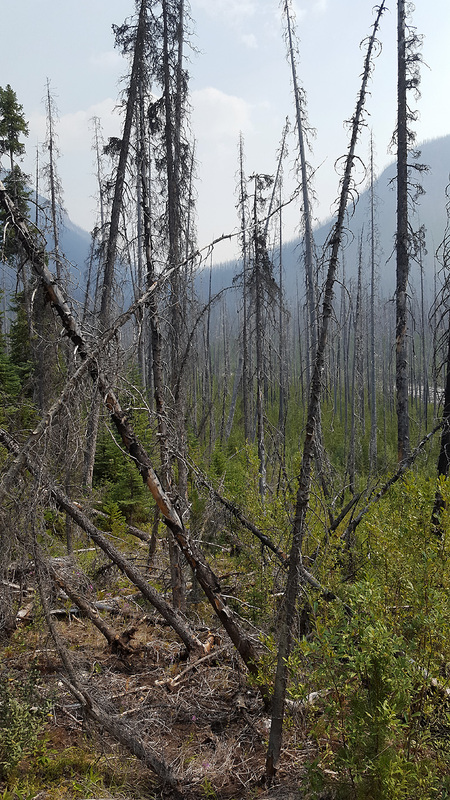 Beautiful pine forest, shielding the breezes. Nearly flat the whole way. A cyclist’s dream. We quickly covered about 17 miles on it, with Phil pushing way out front. We stop at an overlook for 20 minutes to snack. 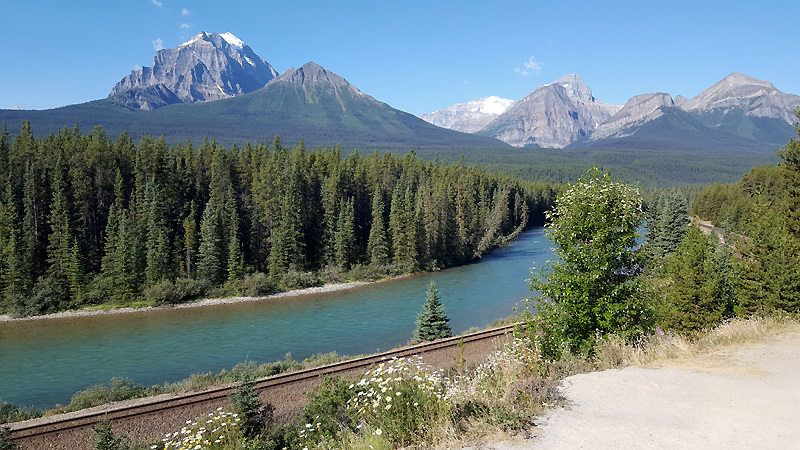 The views are fantastic, with the Bow River beneath us and snow covered peaks in the hazy distance. We take turns challenging each other to toss rocks out into the river. 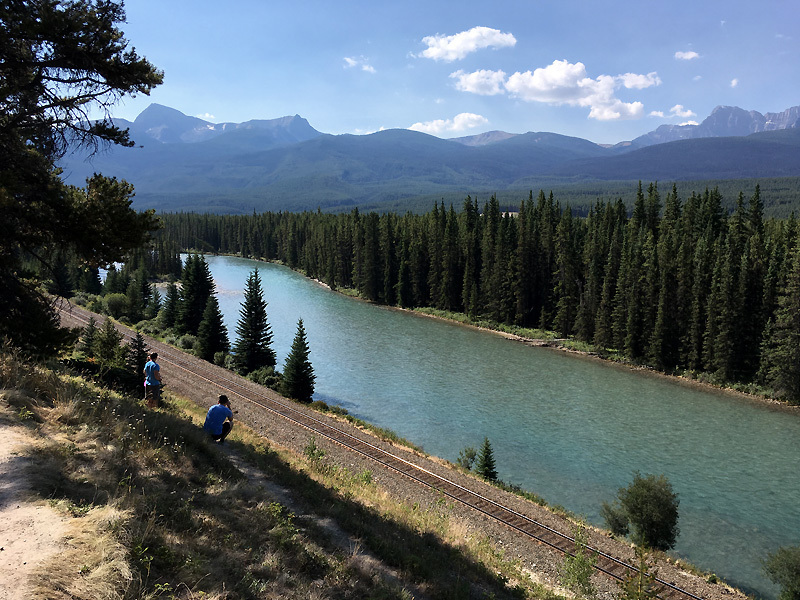 Jack finally declared a challenge to hit a track rail beneath us in front of the river. I immediately started laughing – c’mon no way, couldn’t do it with 500 rocks. Jack’s very first arching throw traces perfectly and hits the rail squarely. Ping! Unbelievable – what a shot. Could you hit the rail of that track down there? Once at Castle Junction, armed with the bcdrive report, we decide not to check out the 93 entrance. Instead we pass it by to examine the Castle Mountain campsite, unmarked on our maps. Beautiful but completely full – every site taken already. Sit for a pow-wow. 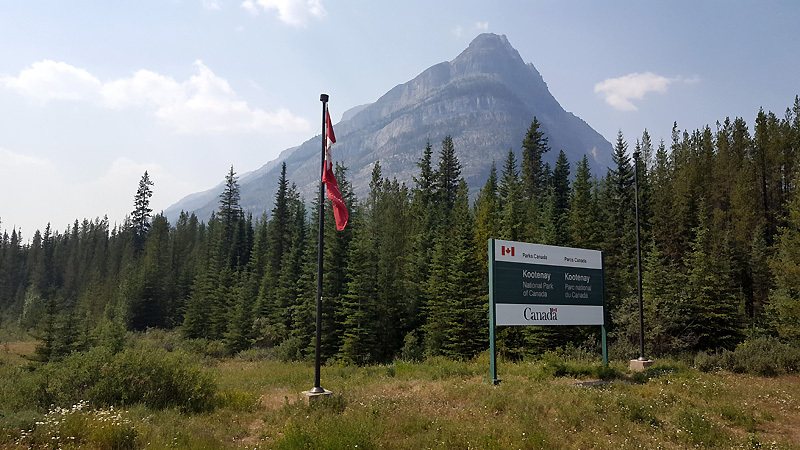 Today’s trip to Banff is an out-and-back. 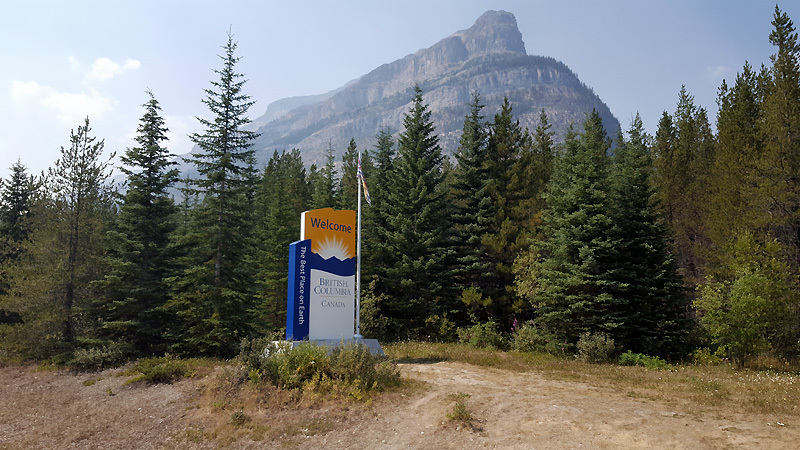 In fact, Phil’s asked several times, “Why are we going to Banff?” My texts with Linda indicate to me that we aren’t likely to miss much, that Banff itself is a clogged tourist town. 93 heading south is (supposedly) open but on a hour-by-hour basis. A bird in the hand. This time we decide to take it, head down 93, with a simple plan to find camping somewhere. We figure the closures and/or smoke might help empty out the campsites. We backtrack to Castle Junction and pick up some food from the c-store. In retrospect, we definitely did not pick up enough. Off we go, headed south down 93. Traffic patrol vehicles are parked at the road entrance, but they aren’t stopping anyone. Excellent! We figure that once through, we’ll be fine. Doubtful they’d sweep us cyclists off even if the road later closed. 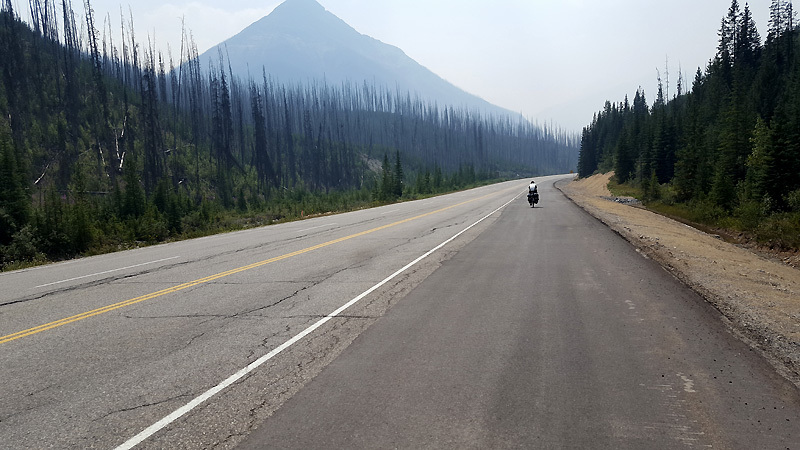 A thousand foot climb to Vermillion Pass ensues. Up and up and up we go. 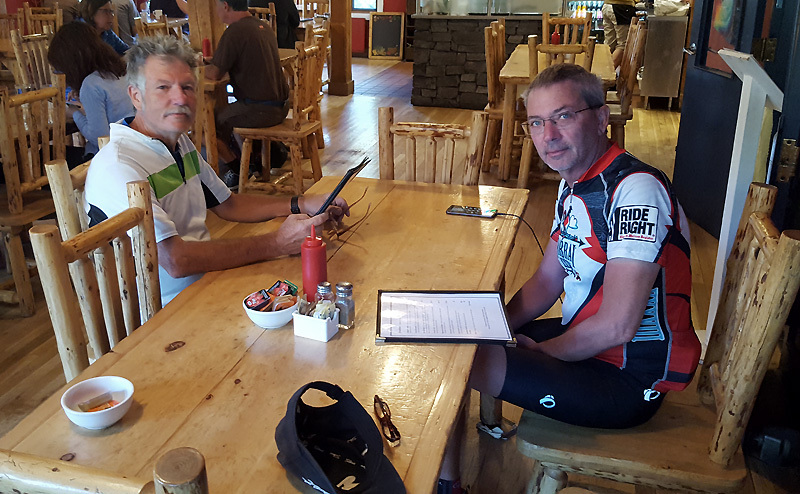 At the Storm Mountain Lodge I pull off to examine their deli cabinet. A cool place, crunchy and upscale. They have good looking pricey sandwiches and I purchase one for later. Jack arrives with information that our only source of food within a day’s range, at Vermillion Crossing, is indefinitely closed due to the fires. The road descends fairly gradually from the pass. From a touring standpoint, that is delightful. Given a choice, I’d much rather labor up a steep few miles, then have the downhill stretched out for 15 miles at a reduced slope. 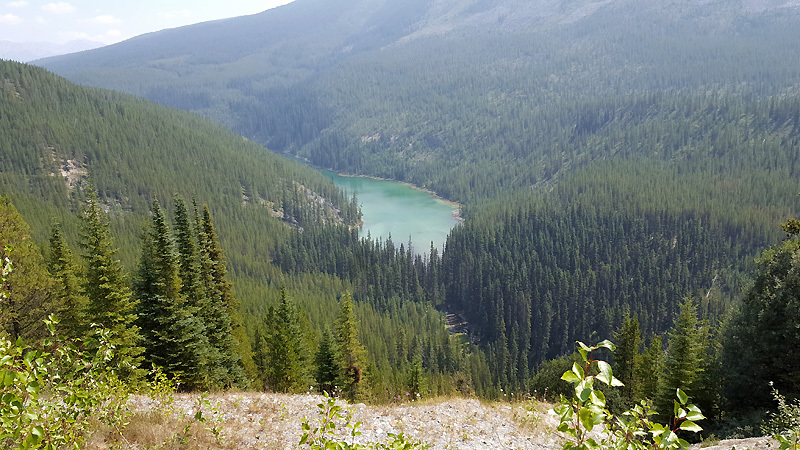 We cross into Kootenay National Park, and in doing so also cross in British Columbia. 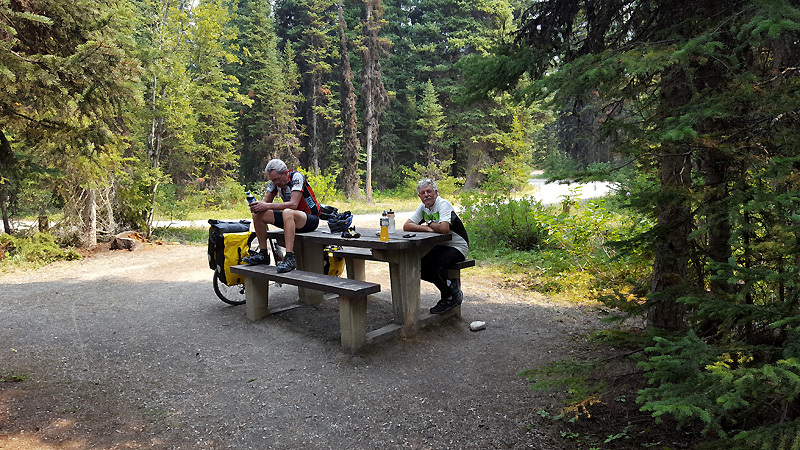 We reach Marble Canyon Campground. As we suspected, it’s mostly empty – tons of available sites. The air is lightly hazy with smoke but I could only detect the smell of it with a deep inhalation. 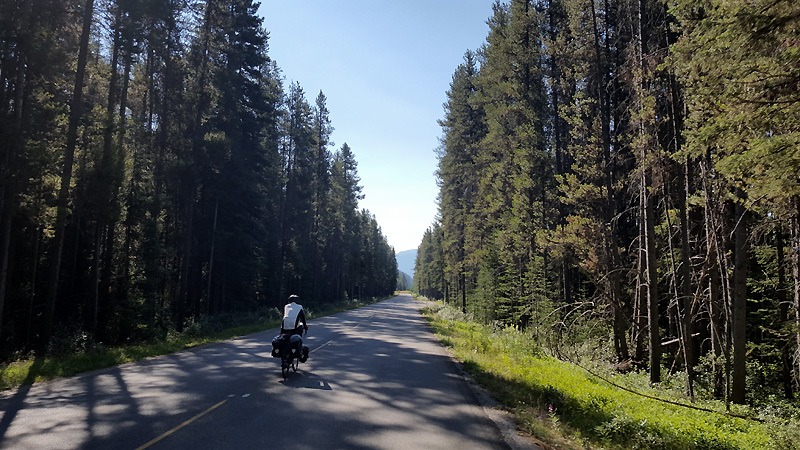 About 57 more miles to the next food (Radium Hot Springs). About 38 more miles to the next campground. Thus, at only 2:30 in the afternoon, we decide to set up camp. I set up a Pringles can about 25′ away on the camp road with a challenge to hit it with a pebble. Picking up the first stone, I hit the can cleanly right in the center. No where near as cool as Jack’s rail shot, but pretty remarkable. Unfortunately, the shot killed the game. Jack pulls out his iPad. He has a few movies downloaded and we soon select The Lone Ranger with Armie Hammer and Johnny Depp. I’d seen previous clips which looked pretty funny, and the movie lives up to all my expectations (in a good way). 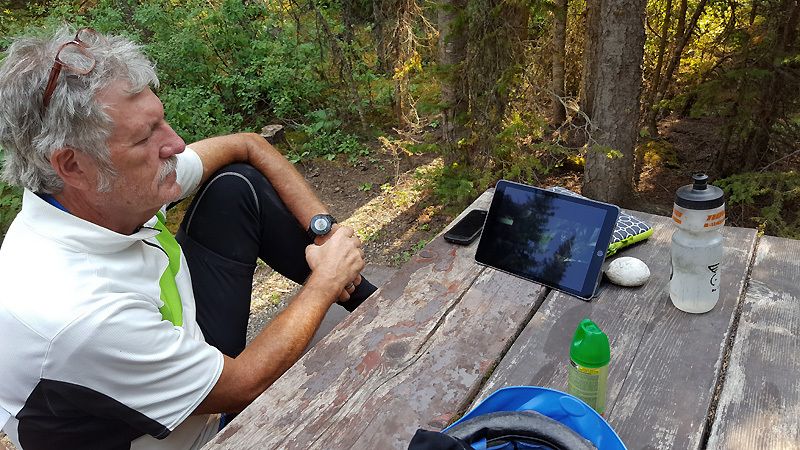 It’s hard to describe the feeling of sitting there at a primitive picnic table in a magnificent forest of pines crowded around a tablet watching a goofball movie. Damned fine I think. 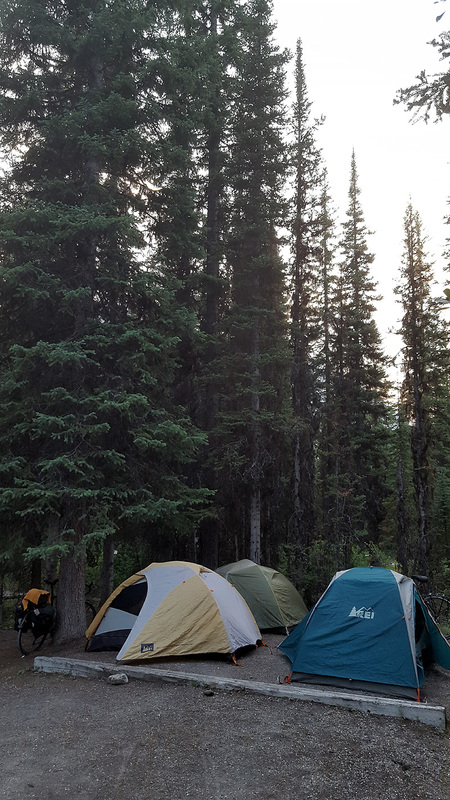 We follow up with tent setup and then dinner. All three of our food inventories are borderline inadequate, given tomorrow’s ride with no source, so we ration accordingly. Conversation ranges from movies to time travel to artificial intelligence. Geektalk. A campfire would have been superb, but of course, they are completely banned this summer. At least the temperature is warmer than 2 days ago. In fact, it’s SUCH a fine evening I just don’t want to duck into the tent. Phil crashes early as is his pattern, and Jack an hour or more later. The plan is to get up early, start at 6 and depart at 7 due to tomorrow’s miles, which will likely involve more smoke.